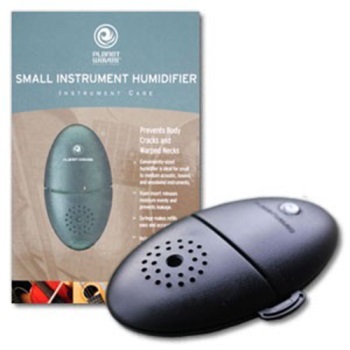 Planet Waves' Humidifier protects your instrument even in the driest conditions. The humidifier has an open-cell phenolic foam insert rather than ordinary sponge. The foam shrinks less than 1% when dry vs. sponge, which can deform dramatically, resulting in leakage. The humidifier is also equipped with a syringe, which allows you to control the amount of water used when filling or refilling the humidifier. Maintaining the humidifier is as easy as squirting distilled water into the nozzle when the element begins to dry. The frequency of maintenance will vary considerably depending on your specific atmospheric conditions. Get one for all of your valuable instruments, whether fretted, bowed or woodwind. It's the smart, easy way to protect your investment.